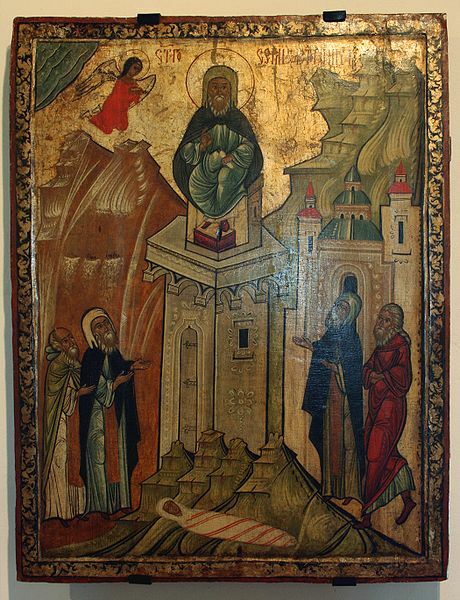 To thee, O Queen of Prophets, foreseen by them, Mother of God and of His people, to thee we have recourse in our necessities, confident that as thou thyself art the fulfilment of prophecy, so thou wilt desire the fulfilment of thy own words, bringing, out of all generations, N_______, to call thee blessed. Say to all the erring for whom we beseech thee, and especially to N________, "Thy light has come." Say but one word to thy Son, and the glory of the Lord shall rise upon them, and the eyes of the blind shall be opened, and so they, wondering at the star, will follow into the house of bread, where, finding thy Child with thee, they will eat of the true bread and live forever, possessing joy and gladness, while sorrow and sadness will disappear. O thou who art omnipotent in prayer, at whose request thy Son worked his first miracle, beg Him to say: "I the Lord will do this suddenly in its time," and grant to those for whom we pray, that they may draw water with joy at the fountains of the Saviour. 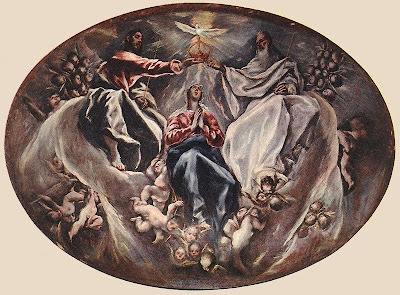 May it be granted to us all to be united with thee, O Mother, in singing thy Magnificat to Him thy Son, our Lord Jesus. 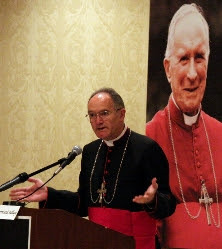 Please take a few minutes to listen to the sermon of His Excellency Bishop Fellay via DICI. 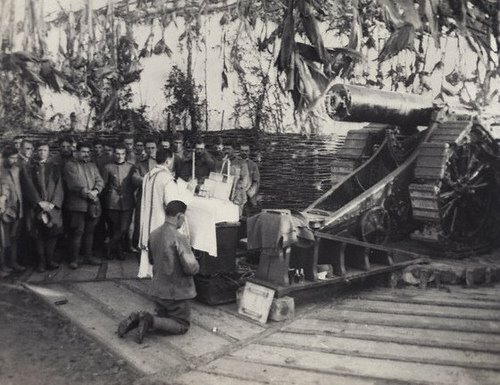 Given in English at Villepreux, France for the SSPX's pilgrimage to Orleans in commemoration of the 600th anniversary of the birth of St. Joan of Arc. "It seems clear that, if we are wanted, it is to reintroduce Tradition in the Church, if we can speak like this. 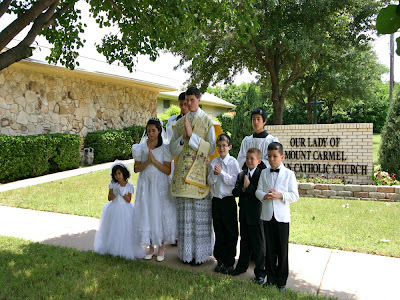 Therefore not for us only, but also for all the Church, so that the whole Church may gain from it, from this magnificent thing, the Christian life..."
These images are taken from the website of the SSPX and are from Our Lady of Mount Carmel Church at the Dallas-Ft. Worth area chapel in North Richland Hills. Fr. Richard Boyle is the pastor of the chapel. Please let us pray for these children to preserve in God's grace! Simon was born in 389 in a village called Sisan in the suburbs of Antioch. When he was young, he worked as shepherd with his father and brothers. In the mountains where he was tending the sheep, he learnt calmness and contemplation. He also grew used to solitude and silence. It happened once that while he was meditating, he heard a priest reading the Gospel of the Sermon on the Mount: "Blessed are the poor in spirit. Blessed are they that mourn. Blessed are the meek. Blessed are the hungry. Blessed are the clean of heart …” These words touched his heart, and he asked the priest to explain this interesting reading. Then after having had a dream, he decided to join a monastery, to free himself up for the worship of God. First he went to a monastery near his village, at which he remained for two years. After that time, Simon moved to another monastery, where he stayed for ten years, learning about life as a monk from Eliothoros. 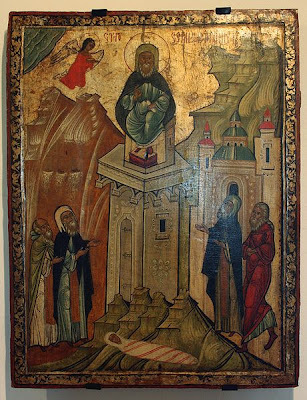 Later, Simon went to a well that had little water, and he stayed there praising God until the superior of the monastery sent two monks searching him. They found him in a sorry state and brought him back to his cell. After some time had passed, Simon again wanted to be alone in the mountains and to devote himself to the worship of God. He left the monastery and stayed in a cottage for three years. But he was seeking a more ascetical life. He left the cottage and went to a highland where he built a hermitage without roof, exposed to the changes of the weather. The news of his holiness spread throughout the region, people came asking his blessing and counsel, and healing for the sick. He was afraid of losing the spirit of silence and prayer, so he left this hermitage. He arrived at a deserted place, where he built a narrow column, and climbed up it, spending forty-two years up there. Most of his time he spent praying softly to God for the Church and for those who asked his prayers. But the people sought him out and found him. They came to him and joined him in prayer. He saw in this the will of God, and made of his post a spiritual symbol pointing to the evangelical virtues and urged people to look on heaven and seek the kingdom of God. 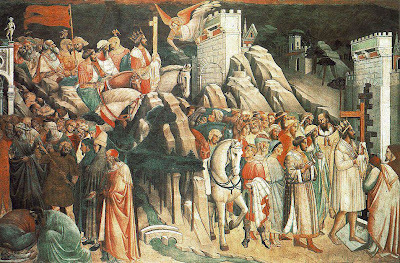 In his seventieth year, in AD 459, illness struck him; he was ill for four days, and after giving his blessing to the crowds, Simon passed away. 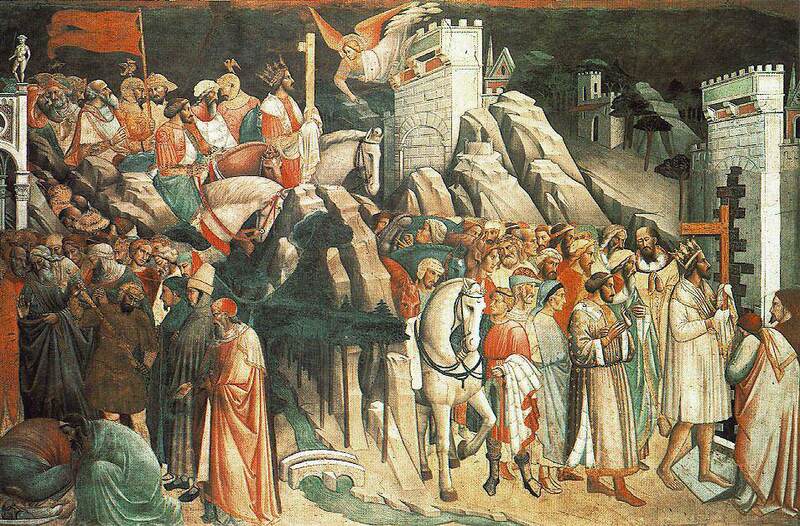 The faithful ran to carry his corpse to Antioch, where he was buried in a solemn celebration. After his death, the Emperor Zenon came and built a great church around the column in the form of a Cross. 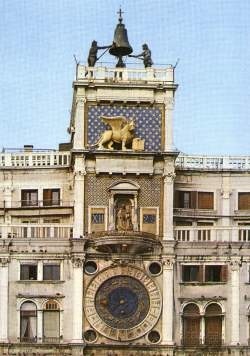 This monument remains to the present day, and it is considered as a jewel among the churches, and is called "The forgotten Cities”. It is one of the greater and more grandiose Churches that has ever been built in the world. Gregorian chant notation from the Liber Usualis (1961), pp. 880-881. Latin lyrics sung by the Benedictine monks of Santo Domingo de Silos. 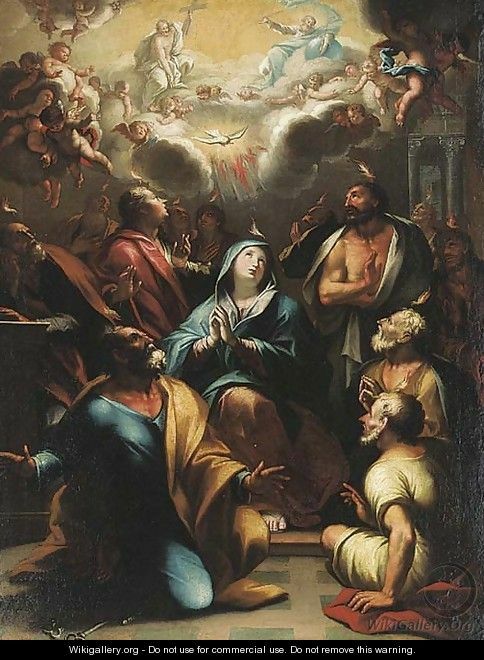 Veni Sancte Spiritus, sometimes called the "Golden Sequence," is a sequence prescribed in the Roman Liturgy for the Masses of Pentecost and its octave, exclusive of the following Sunday (Trinity Sunday). 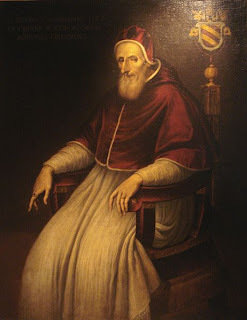 It is usually attributed to either the thirteenth-century Pope Innocent III or to the Archbishop of Canterbury Stephen Langton, although it has been attributed to others as well. Veni Sancte Spiritus is one of only four medieval Sequences which were preserved in the Missale Romanum published in 1570 following the Council of Trent (1545-63). Before Trent many feasts had their own sequences. Cardinal Brandmuller: "Not all of Vatican II is binding"
Here we have yet another prelate re-emphasizing the fact that the texts of the Second Vatican Council are not binding. Though these admissions would have been welcome even earlier, the growing number of such statements shows that perhaps the wind is starting to blow in a different direction. 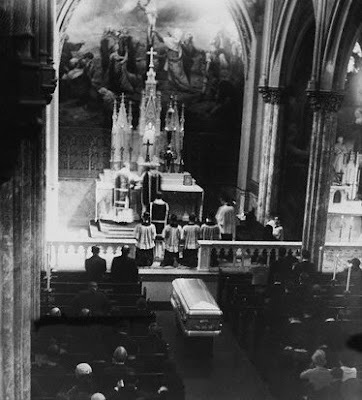 One can imagine how much differently the 1970’s and 1980’s may have been if one did not have to pretend that Vatican II contained the same doctrinal content as Nicea or Trent. The 16 texts of Vatican II are titled in different ways. Here are a few examples among the most controversial texts: Some are called: Dogmatic Constitution (Lumen Gentium), Decree (Unitatis Redintegratio) Declaration (Dignitatis Humane; Nostra Aetate), and Pastoral Constitution (Gaudium et Spes. )Obviously they do not have the same value and the same level of importance. For instance, the Dogmatic Constitution Lumen Gentium speaks about the nature and definition of the Church whereas its equivalent, Gaudium et Spes, speaks of the Church in its relation with the present world. 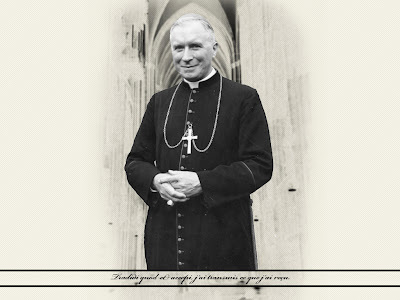 Has Bishop Fellay Betrayed Archbishop Lefebvre? The following article is taken from a 2007 book by Fr. Celier, SSPX, and counters the claim that Bishop Fellay has abandoned the principles of Archbishop Lefebvre by his attitude and position towards Rome and the Holy Father. It's particularly good because Fr. Celier has been a priest for over 25 years, and knew Archbishop Lefebvre personally. Written by Preston E Wiggins, Jr, Marriage in the Heart and the Mind of the Church is a series of reflections on the Sacrament of Holy Matrimony. Intended for couples preparing to receive the Sacrament, this guide prepares the couple for the Sacrament of Matrimony and the interior dispositions necessary for marriage. Available in a 94 page paperback, this book draws upon the writings of Pope John Paul II, Pope Paul VI, Pope Pius XII, and Christopher West to present a comprehensive marriage preparation aid. A must read for all couples and a great resource for parishes to use with couples! In his 1978 Apostolic Exhortation Catechesi Tradendae (On Catechesis In Our Time), Pope John Paul II proclaimed “the definitive aim of catechesis is to put people not only in touch but in communion, in intimacy, with Jesus Christ.” This sounds like a high and lofty goal, but what does it look like? Our Lord and Savior Jesus Christ taught using parables; this helped His audience to understand because parables bring the supernatural into the natural realm. His technique was to use a situation that His listeners would be familiar with in order to unveil certain supernatural truths (cf. Mt 11:25). Can we use this method to find a modern day “visual” (parable) of what exactly does an intimate communion look like? We are all called, by virtue of our Baptism, to be in an intimate communion with Jesus Christ. I did not really begin to understand what this entails until I was granted the great privilege of being united as one with the former Susan Kamaski. 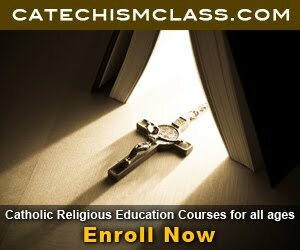 I had spent two years in a pre-theologate program in serious discernment for the priesthood. The time was well spent as I drew closer to the Lord, fell more in love with His Church, and built a life firmly anchored on the Rock foundation that is Jesus Christ. I had no doubt that God, our Father, truly loved me as a beloved son, as did the Blessed Mother. A relationship I had, but I was not sure just what the nature of that relationship was. A week after our marriage, I began to realize that there was a different quality to our relationship; we had a union that did not exist before we said, “I do.” This new intimate communion with Susan was the catalyst for reflection and meditation on the nature of one’s relationship with Jesus Christ. Two titles of the Church have been the primary fuel of my reflections: the Bride of Christ and the Body of Christ. In recent years, there has been a widespread discovery of Pope John Paul II’s Theology of the Body,which gave credence to my conviction that the nature of our relationship with Jesus is spousal. This book is a tribute to those reflections, guided by the Holy Spirit with frequent contact with Sacred Scripture and the Catechism of the Catholic Church. These reflections are augmented by the reality of the emotional and psychological damage that children experience due to an unstable family life that my wife has witnessed as a mental health counselor, our own experience as mentors for engaged couples and our involvement in Engaged Encounter. I have brought these reflections into talks and teaching with head bobs of agreement from the participants. Hopefully, you, too, will bob your head in agreement and be motivated to do whatever you can to strengthen marriages and families as God has planned from the very beginning. 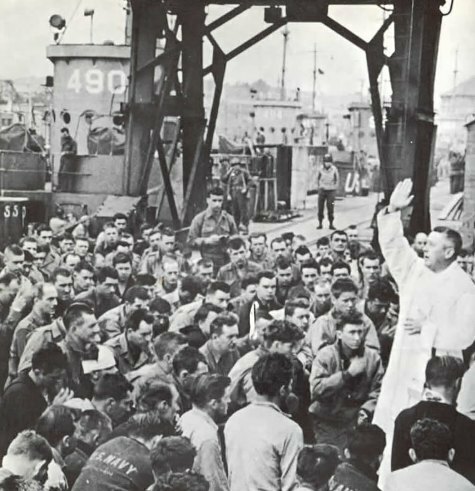 There is little that is more powerful than prayer and witness of faithful Catholics madly in love with Jesus Christ. Of all the seasons that the Modern Novus Ordo Catholic Calendar has neglected to properly retain and celebrate, Ascensiontide has, like Epiphanytide, unfortunately fallen by the wayside. But, for those Catholics committed to the Sacred Traditions of the past, Ascensiontide holds a special length of time. So what exactly is Ascensiontide and what customs do traditional Catholics observe during this time? Taking place 40 days after Easter Sunday, the Church celebrates Our Lord's Glorious Ascension into Heaven. 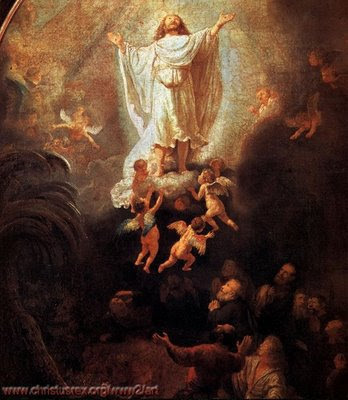 The Ascension has three principal parts: the departure of Jesus from earth, His going up into heaven, and taking His place at the right hand of the Father. Let us not forget the importance of celebrating this feast on Thursday - as opposed to the following Sunday. In so doing, the Faithful lose the significance and importance in the fortieth day after the Resurrection. It was precisely on the fortieth day after our Lord's Resurrection that He ascended into Heaven. Regarding the place from which Christ ascended, Sulpicius, bishop of Jerusalem, says, and the 'Gloss' also says, that when a church was built [on the Mount of Olives] later on, the spot where Christ had stood could never be covered with pavement; and more than that, the marble slabs placed there burst upwards into the faces of those who were laying them. He also says that footmarks in the dust there prove that the Lord had stood on that spot: the footprints are discernible and the ground still retains the depressions his feet had left. For this season of Ascensiontide, Catholics are welcomed and encouraged to immerse themselves in the devotions appropriate for the season. For example, during this season there are special prayers for the time between Ascension and Pentecost. In the pre-1962 calendar this was an 'octave', and remnants of the octave can be found in the Office as it now stands. The appropriate texts for the minor hours (except for the collects) are set out in the psalter. For the collects, Lauds and Vespers however, you need to keep your ribbon on the page for the Ordinary of Ascensiontide. The key points to note are set out below. note that the chapters and versicles are in the psalter for Ascensiontide (Tempore Ascensionis). the collects are as for Lauds. As one can notice, the Octave of the Pentecost ranked even higher than the Octave of Christmas! This message comes from a reader. If you know of any information for him, please post it in the comment box. 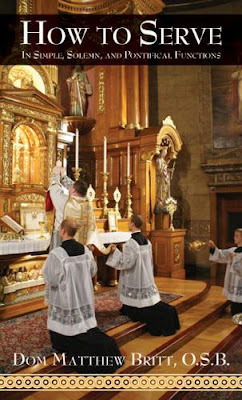 Are there any plans to bring the TLM to Tacoma, WA ?? There are some in Seattle. There is one in Tacoma called St. Marys; however I believe they are sedevacantists and are in schism. Seattle in quite the drive though 30 + miles one way. I am a Traditional Roman Catholic. 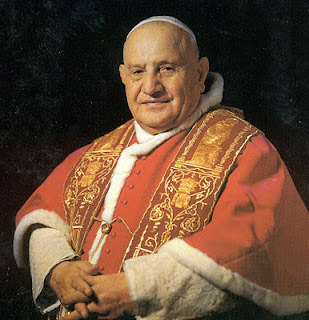 "He has always expressed a desire to subordinate ourselves to the Pope, granting protection for the growth of Tradition, the existence of the Society, and guarantees that we will not be asked to minimize the fight, nor to compromise on the Faith. 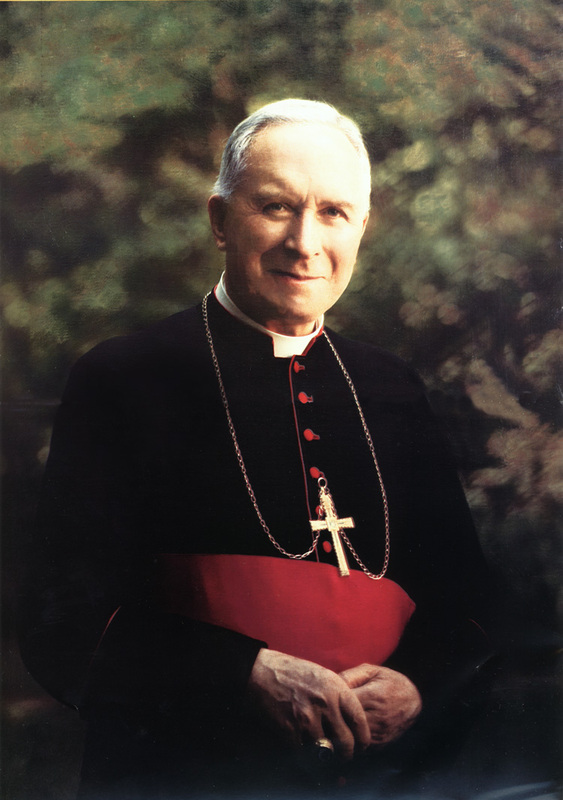 As he said in 1987: “If Rome really wants to give us true autonomy, like we have now but with our submission—we would like to be submitted to the Holy Father, and we have always wished for it...if Rome agrees to let us try this experiment of Tradition, there will no longer be any problem.” (Fideliter no. 60, Nov./Dec. 1987) "
Please see my post on Ascension Thursday for information on this High Holy Day. The mystery of our salvation, dearly-beloved, which the Creator of the universe valued at the price of His blood, has now been carried out under conditions of humiliation from the day of His bodily birth to the end of His Passion. And although even in "the form of a slave" many signs of Divinity have beamed out, yet the events of all that period served particularly to show the reality of His assumed Manhood. But after the Passion, when the chains of death were broken, which had exposed its own strength by attacking Him, Who was ignorant of sin, weakness was turned into power, mortality into eternity, contumely into glory, which the Lord Jesus Christ showed by many clear proofs in the sight of many, until He carried even into heaven the triumphant victory which He had won over the dead. As therefore at the Easter commemoration, the Lord's Resurrection was the cause of our rejoicing; so the subject of our present gladness is His Ascension, as we commemorate and duly venerate that day on which the Nature of our humility in Christ was raised above all the host of heaven, over all the ranks of angels, beyond the height of all powers, to sit with God the Father. On which Providential order of events we are founded and built up, that God's Grace might become more wondrous, when, notwithstanding the removal from men's sight of what was rightly felt to command their awe, faith did not fail, hope did not waver, love did not grow cold. For it is the strength of great minds and the light of firmly-faithful souls, unhesitatingly to believe what is not seen with the bodily sight, and there to fix one's affections whither you cannot direct your gaze. And whence should this Godliness spring up in our hearts, or how should a man be justified by faith, if our salvation rested on those things only which lie beneath our eyes? Hence our Lord said to him who seemed to doubt of Christ's Resurrection, until he had tested by sight and touch the traces of His Passion in His very Flesh, "because you have seen Me, you have believed: blessed are they who have not seen and yet have believed John 20:29 ." In order, therefore, dearly-beloved, that we may be capable of this blessedness, when all things were fulfilled which concerned the Gospel preaching and the mysteries of the New Testament, our Lord Jesus Christ, on the fortieth day after the Resurrection in the presence of the disciples, was raised into heaven, and terminated His presence with us in the body, to abide on the Father's right hand until the times Divinely fore-ordained for multiplying the sons of the Church are accomplished, and He comes to judge the living and the dead in the same flesh in which He ascended. And so that which till then was visible of our Redeemer was changed into a sacramental presence , and that faith might be more excellent and stronger, sight gave way to doctrine, the authority of which was to be accepted by believing hearts enlightened with rays from above. This Faith, increased by the Lord's Ascension and established by the gift of the Holy Ghost, was not terrified by bonds, imprisonments, banishments, hunger, fire, attacks by wild beasts, refined torments of cruel persecutors. For this Faith throughout the world not only men, but even women, not only beardless boys, but even tender maids, fought to the shedding of their blood. This Faith cast out spirits, drove off sicknesses, raised the dead: and through it the blessed Apostles themselves also, who after being confirmed by so many miracles and instructed by so many discourses, had yet been panic-stricken by the horrors of the Lord's Passion and had not accepted the truth of His resurrection without hesitation, made such progress after the Lord's Ascension that everything which had previously filled them with fear was turned into joy. For they had lifted the whole contemplation of their mind to the Godhead of Him that sat at the Father's right hand, and were no longer hindered by the barrier of corporeal sight from directing their mind.' gaze to That Which had never quitted the Father's side in descending to earth, and had not forsaken the disciples in ascending to heaven. An exclusive interview with Bishop Bernard Fellay, superior general of the Society of St. Pius X, at the society's headquarters in Menzingen, Switzerland. 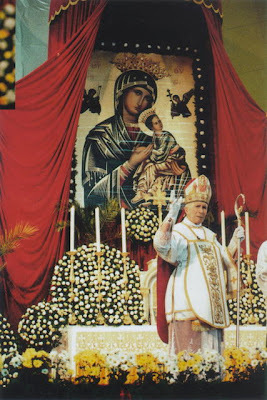 Bishop Fellay has been at the heart of a drama within the Catholic Church since he was ordained by the group's founder, Archbishop Marcel Lefebvre, in 1988, protesting the modernizing reforms of the Second Vatican Council. Since 2009, he has been involved in private doctrinal talks with Rome in an effort to overcome the division between his traditionalist society and the Vatican. An announcement is expected by the end of May regarding the outcome of those talks. 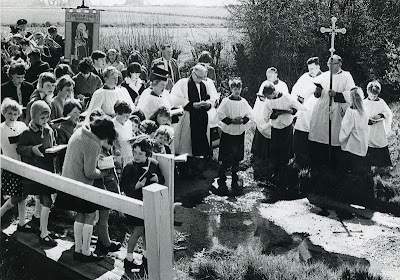 While no longer required after Vatican II, the observation of Rogation Days is still encouraged. This year the Minor Rogation, the days leading up to Ascension Thursday, are May 14-16 inclusive. Today is the first day of the Minor Rogation, a day which should be a day of fasting. Today is the anniversary of the Blessed Virgin Mary's first apparition to Fatima on May 13th. See my post on Fatima for more information and photos. “Oh, yes, alright,” my cousins responded. We started to come down from the hill taking the sheep down the path. In the middle of our way on the slope, near the evergreen oak which still exists today, we saw a flash of lightning and after we took some more steps over the slope, we saw a Lady dressed in white, more brilliant than the sun, scattering clear and intense light, more than a ray of sunlight through a glass of water. Image Source: Take from the Facebook Page (Marian Events). The one who designed the photo is Mr. John Ryan M. Debil from the Philippines. As I’m sure you’ve seen, there is a lot of news coming out in both national and Catholic media outlets about discussions between Rome and the Society. Too often these blog posts and news reports take the form of sensationalism, gossip, rumor-mongering, etc. and seem to have as an aim to put undue pressure on those charged with leading the Society. I understand that many may come to different conclusions, but I don’t think anyone would argue that we can use different facts to come to those conclusions. For this reason, I’m encouraging you to join the Society’s email list. Regardless of what side of the fence people fall on, the current news and information on events between Rome and the Society is certainly historic. For that reason, the email list will deliver official Society information and commentary as it becomes available on any breaking news, new articles, events, etc. From May 3rd, traditional feast of the Finding of the Cross, until September 14th, Feast of the Exaltation of the Holy Cross, a special blessing beseeching God’s protection against violent and damaging storms may be given with a relic of the True Cross of Our Lord Jesus Christ. This blessing from the Roman Ritual will be given after Mass on Fridays at the Shrine of Christ the King Sovereign Priest (as well as other oratories for the Institute of Christ the King). In light of this, I wanted to share this beautiful prayer from the Rituale Romanum. 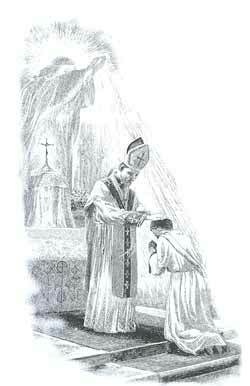 Share with your priests and encourage them to say this blessing as per the above rubrics. V. A fúlgure, grádine et tempestáte. R. Líbera nos, Dómine Jesu Christe. Orémus. 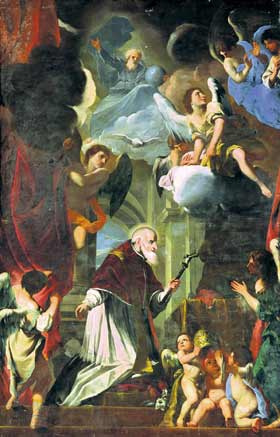 Quaesumus, omnípotens Deus, ut, intercessióne Sanctae Dei Genetrícis Maríae, sanctórum Angelórum, Patriarchárum, Prophetárum, Apostolórum, Mártyrum, Confessórum, Vírginum, Viduárum, et ómnium Sanctórum tuórum, contínuum nobis praestes subsídium, tranquíllam auram permíttas, atque contra fúlgura et tempestátes désuper nobis indígnis tuam salútem effúndas de caelis, et géneri húmano semper aemulas, déxtera poténtiae tuae, aéreas cónteras potestátes. 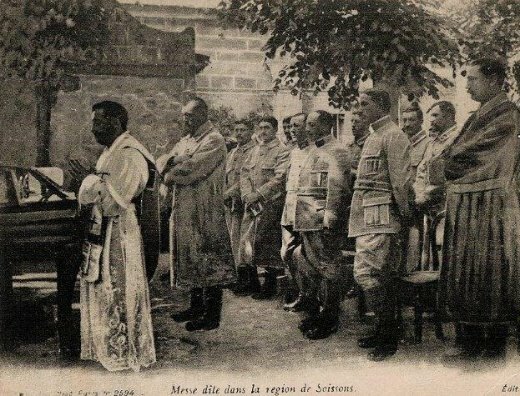 Per eúndem Christum Dóminum nostrum. V. Benedíctio Dei omnipoténtis, Patris + et Fílii, et Spíritus Sancti, descéndat super vos, locum istum et fructus terrae et máneat semper. V. May the blessing of Almighty God, the Father, + the Son, and the Holy Ghost, descend upon you, this place, and the fruits of the earth and remain forever. 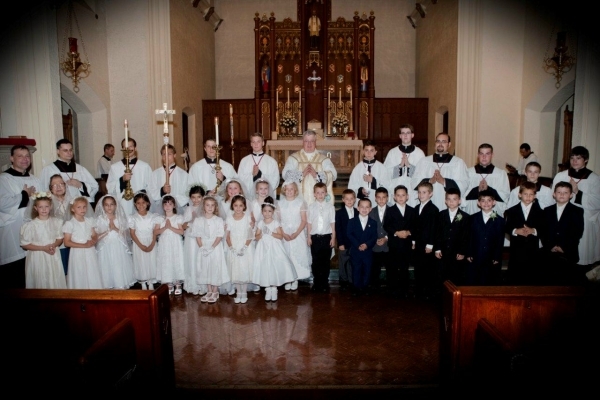 On Sunday, May 8, 2012, at St. Vincent de Paul Church in Kansas City, Missouri, 22 children received our Blessed Lord Jesus Christ in the Blessed Sacrament for the first time. Also receiving her First Communion was a 94-year old lady (an adult convert), the great-grandmother of two of the children. Please keep these 23 souls in your prayers - that they will always remain in God's grace. 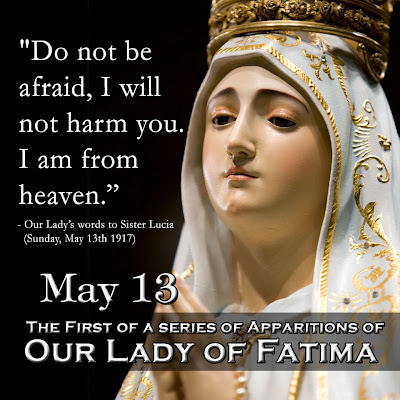 O Lady, Mediatrix of all Graces, ora pro nobis! 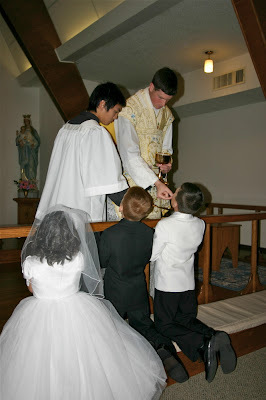 As an altar server myself, I have long wanted to put together a Comprehensive List of Resources for young men wishing to serve the Tridentine Latin Mass. And here is my attempt at such a list. Please leave additional suggestions in the comment box. This list, importantly, includes cards, DVDs, and books. Thus, it is meant to provide a comprehensive list of resources for all learners. Personally, this is the resource I used to learn to serve. It is inexpensive and easy to use. In fact, I kept it with me to study when I had downtime. Highly recommended. While I don't have details on this item, I have seen this item recommended before. See above link for more information. This is a book of letters for all altar boys who, from the smallest one up, are the most important people in their parishes. God's Minutemen is what the author affectionately calls them, for he knows that they are always ready for duty as altar boys, no matter what the personal cost. The author writes this book with the hope that in these letters all acolytes may find encouragement to continue being loyal and faithful in their service of our Lord. Father Rosage shows them that while serving Mass is the greatest honor and the biggest job in the parish, it does demand sacrifice. 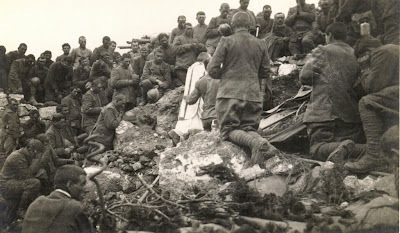 He knows that being on call for duty isn't always easy, and he aims at convincing the boys who have to get up on cold winter mornings to serve early Mass of the great privilege that is theirs. Written in an easy flowing style intelligible to even the very young boys, the book is full of helpful pointers about the correct manner of serving, the necessity of being on time, and many other details on which a boy may slip. It offers inspiration and high motivation for living up to the ideals that a Mass server is committed to follow. An extremely practical book, it leaves not one phase of the altar boy's life untouched. . .120 pp. Softcover. Color photographs. Every altar server of the Traditional Latin Mass needs a well-worn copy of HOW TO SERVE by Dom Matthew Britt. This classic handbook by a master teacher presents a wealth of practical instruction on what to do in the sanctuary and how to do it well. Dom Britt was probably the greatest authority on serving Mass, and this book, though originally published in 1934, is still the best book of its kind. This edition has been re-typeset in a beautiful user-friendly format featuring new photos taken at St. John Cantius parish in Chicago. In 18 chapters the author walks the server step by step through Low Mass with one or two servers, Nuptial Low Mass, High Mass (Missa Cantata), Solemn High Mass, Requiem High Mass, Pontifical High Mass, Benediction and Vespers of varying levels of solemnity. He tells how many servers should be in the sanctuary, which servers (acolytes, thurifer, book-bearer, etc. ), what those servers should do and when they should do it. Dom Britt cover vesture, postures, positions, genuflections, bows, steps, bells, candles, cruets, books, the thurible, the censer and more, also explaining the details of assisting the various ministers of the altar priests, deacons, bishop. Photos illustrate specific actions, and diagrams show the sanctuary positions of acolytes, thurifer, master of ceremonies, etc. Also included are the Latin responses at Mass. Plus, the author shares the sources of his immense knowledge in extremely interesting footnotes. 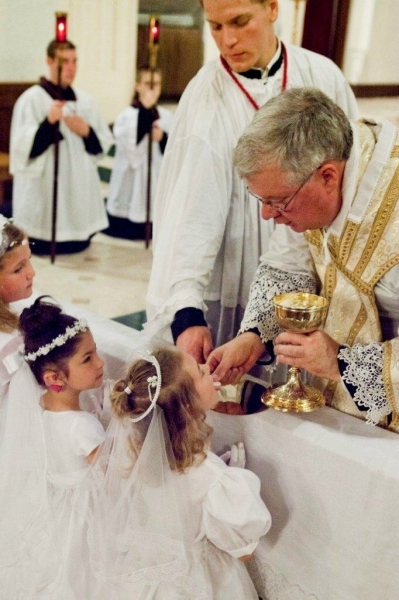 HOW TO SERVE will become an indispensable resource for priests and for all Latin Mass servers as they carry out the sacred functions of the sanctuary. AN EASY-TO-USE training guide for teaching the proper liturgical pronunciation of the Latin responses made by the altar server at Mass. The card's exterior partitions contain the Latin responses with their corresponding English phonetic renderings per the more romano (like the Romans) liturgical pronunciation as endorsed by Popes St. Pius X, Benedict XV, and Pius XI. Also included are expanded rubrical instructions for the liturgical gestures and reverences made in connection with the responses, and the responses made when serving for a bishop. The layout of the exterior partitions was carefully arranged to allow card’s use at the altar if necessary. The card’s inside partitions contain helpful explanations and basic rules about making the responses, more romano pronunciation, a list of common pronunciation mistakes made by English-speakers, and even several informative and authoritative footnotes. Red and black text was printed on heavy matte paper stock (to keep the card stiff when being held), then coated with a matte varnish to increase the anti-glare property and protect the card from moisture and frequent use. Measures folded at 11 14/16" x 4¼" (folds out completely to 17” wide). With the Catholic media abuzz over the discussions between the SSPX and the Roman officials, I wish to publish here the recent letter from Fr. Arnaud Rostand, District Superior of the US SSPX. His words can help us steer away from media bias and emotionalism. 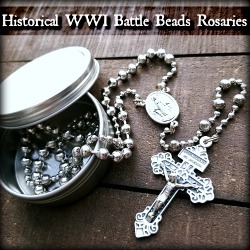 And don't forget to please join us in praying the Rosary Crusade in anticipation for its end this Pentecost Sunday! Remember unity is not possible between those who adhere to Tradition and those who adhere to new modern versions of the Faith. We must pray through this all for the Holy Church - that She may be protected and defended. In a letter dated April 17, 2012, the Superior General of the Society of St. Pius X responded to the request for clarification that had been made to him on March 16 by Cardinal William Levada concerning the Doctrinal Preamble delivered on September 14, 2011. As the press release dated today from the Ecclesia Dei Commission indicates, the text of this response “will be examined by the dicastery (Congregation for the Doctrine of the Faith) then submitted to the Holy Father for his judgment". The matter is in the hands of the Holy Father and we are waiting for His decision. Let us remember that it is to our Superior General, and only to him, that has been entrusted by the law of the Church and the will of Archbishop Lefebvre the delicate task of our relations with Rome. As such, he is the only competent authority to take prudent decisions for our Society. Because of his function and his 18 years of leadership in keeping the Faith and seeking the common good of the Church, we renew to him all our confidence, trust and respectful obedience in this difficult time. Our filial piety to him, as to the Sovereign Pontiff, pushes us to do more than usual in these unusual circumstances: we desire to bring to them the support of all your prayers. In honor of Pope St. Pius V, who codified for all times and all peoples the Tridentine Mass on this his feast day, May 5th. Furthermore, by these presents [this law], in virtue of Our Apostolic authority, We grant and concede in perpetuity that, for the chanting or reading of the Mass in any church whatsoever, this Missal is hereafter to be followed absolutely, without any scruple of conscience or fear of incurring any penalty, judgment, or censure, and may freely and lawfully be used. Nor are superiors, administrators, canons, chaplains, and other secular priests, or religious, of whatever title designated, obliged to celebrate the Mass otherwise than as enjoined by Us. 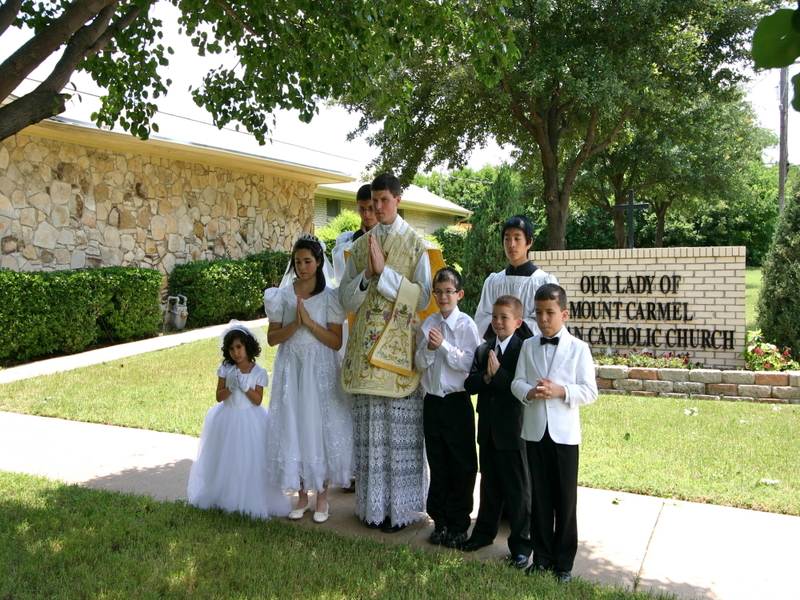 We likewise declare and ordain that no one whosoever is forced or coerced to alter this Missal, and that this present document cannot be revoked or modified, but remain always valid and retain its full force notwithstanding the previous constitutions and decrees of the Holy See, as well as any general or special constitutions or edicts of provincial or synodal councils, and notwithstanding the practice and custom of the aforesaid churches, established by long and immemorial prescription - except, however, if more than two hundred years' standing. A reader recently asked me a very interesting question, "What are the devotional prayer books that you use most often?" 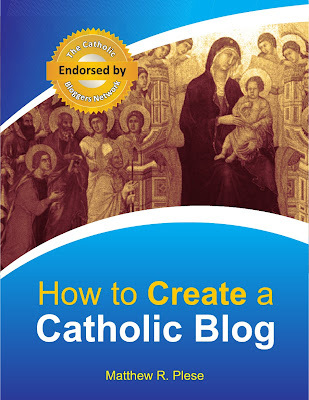 That question started a thought process that has led me to compile this list - 7 Catholic Devotional Books I Couldn't Live Without. These are all items on my current book shelf that I use at least weekly (if not daily). Some are strictly "prayer" books while others are a little more broad in scope. Regardless, here is my list of the Top 7 Catholic Prayer Books that I use most often. They are listed in no particular order. This book produced by the Midwestern Theological Forum has been on my shelf for nearly 5 years. The preface is written by now-Cardinal Dolan. Used by the students and faculty of the North American College in Rome, this book is considered a must-have for priests and seminarians. It includes an extensive collection of prayers in English, Spanish, Italian, and Latin drawn from the Liturgy and the writings of the saints. I have used it for the Stations of the Cross each week on Friday as well as for other feastdays. Never overlook the power of little prayer booklets. When I visited Conception Abbey and the nearby Benedictine Convent of Perpetual Adoration (Clyde, MO) in 2006, I picked up a copy of a 10 cent prayer book entitled "St. Jude Thaddeus: Helper in Desperate Cases and St. Rita: Advocate of the Impossible." I have used this book nearly weekly since then. In front my home altar (which now has candles dedicated to St. Jude), I recite the prayers to St. Jude mentioned in this little booklet. The booklet has little sections on How to Obtain the Aid of St. Jude, Devotions in honor of St. Jude, An Explanation of St. Jude's Epistle, and other little sections. It's a very nice devotional book that I'm very glad to have picked up. This little booklet I received way back in 2005 - in fact, it is one of the first devotional books that I ever received as a gift. "Miracle Hour: A Method of Prayer That Will Change Your Life" by Linda Schubert takes an hour and divides it evenly into 12 forms of prayer. There is a section for prayers on praise, on signing, on surrender, on forgiveness, on listening to our Lord's voice, on intercessions, thanksgiving, etc. This nicely structured prayer booklet has accompanied me many times to Eucharistic Adoration. I recommend it. Chalice of Strength: Prayers for Priests was published in 1996 by Opus Sanctorum Angelorum Gethsemani Adoration Chapel. Besides the beautiful introduction by Fr. John Hardon, the book contains many prayers to be said for priests. It includes the Litany of the Precious Blood as prayers composed by Pope John Paul II, Paul VI, and Venerable Pope Pius XII. It's a very nice 31 page booklet to use during Eucharistic Adoration. I said that I was not going to write my top seven in any particular order. Well, I know that someone is probably still wondering which of these titles I use the most. And that would be my Roman Catholic Daily Missal (1962) produced by Angelus Press. I use it daily for the morning/evening prayers, weekly for the Devotions for Confession/Holy Communion, and daily to pray the daily Mass Propers. No Catholic should be without a copy of this Missal. Period. I have often mentioned that I pray the Breviary throughout the day as my schedule allows. I strive to say the Divine Office (Divinum Officium) daily. While I typically will not say any of the nocturns of Matins, I will say the office of Lauds and Vespers. I will also almost always say Sext and None. Terce is typically difficult to fit in since I usually say Lauds at 8 AM and I miss 9 AM Terce. But, on a given week, I'll say Terce 3 times. Compline I will say occasionally but sometimes omit it from my daily prayers and add in devotions instead. I use a Breviary that follows the 1962 rules and calendar for Lauds and Vespers. My prayers at other hours use a Breviary that follows the 1955 rules. Since my Latin is far from perfect, I use the Morning and Evening Prayers of the Divine Office: Lauds, Vespers, and Compile for the entire year from the Roman Breviary. It is produced by Benzinger Brothers from 1965. I picked it up at Loomes Books. I'm uncertain how to recommend buying this one since copies will be hard to find. But it is great - try to find one. No Catholic bookshelf is complete without a copy of the Lives of the Saints. I encourage you to research online to find one (if you don't have one) and pick up a copy of Father Hugo Hoever's "Live of the Saints," from which I read daily. While the book does not include saints canonized in recent years, it is something that I am highly recommending. It is based on the pre-Vatican II calendar so the feastdays will match with the Angelus Press calendar that I recommended earlier. Do You Have Advice on Traveling to Econe?